What is The Breadwinner Project? 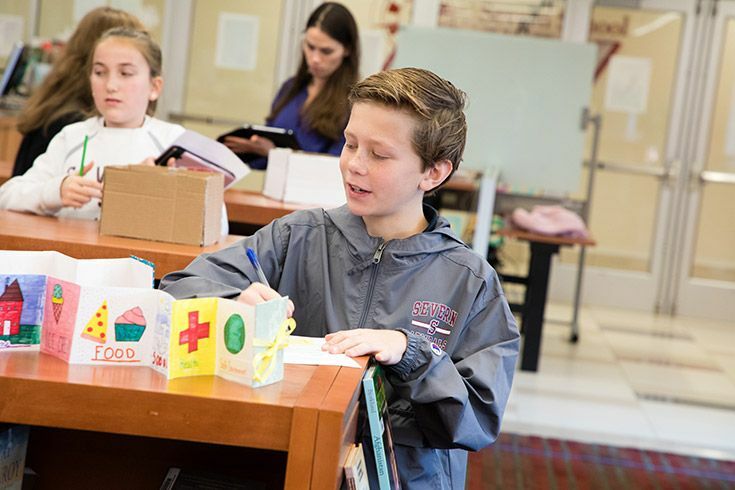 The Breadwinner Project is a research-based unit that spans sixth-grade English, geography, math, art and science. The novel on which the project is based tells the story of an Afghani girl growing up during the early days of the Taliban regime. Our sixth-grade teaching team uses characters, themes and settings from the book to build lessons that weave into each other at different times. Our students work on all of this concurrently, pulling from what they learn in one class to build upon another. The project culminates with "The Breadwinner Museum" where students share and evaluate each other’s work. Sixth graders complete two research assignments to explore the setting of The Breadwinner using academic databases, Google Earth and non-fiction books. Working with geography teacher Ms. Cathy Carper and assistant librarian Ms. Whitney Etchison, students first research to compare the main character’s life to their own. Then they complete a more comprehensive research chart on Afghanistan including information about history, religion, culture and customs, government, food and economics. They also choose an Afghani artifact for focused research and tie that to their more general study about the country. Ms. Drossner selects a number of these pieces for other students to act out at "The Breadwinner Museum." 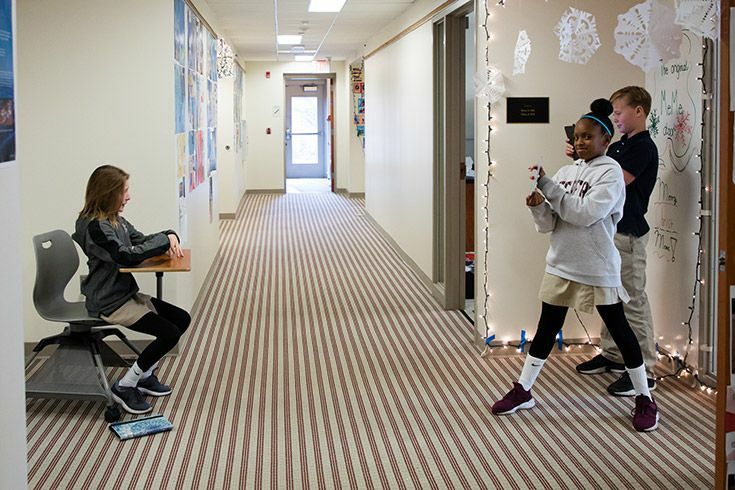 Transforming the stories into skits provides another way for students to connect with the material and get know the writing styles and ideas of their classmates. For the expository assignment, sixth graders use the artifact they selected in geography as the basis for their writing. They write a paragraph that not only includes accurate research and citations but also flows and maintains interest for the reader. 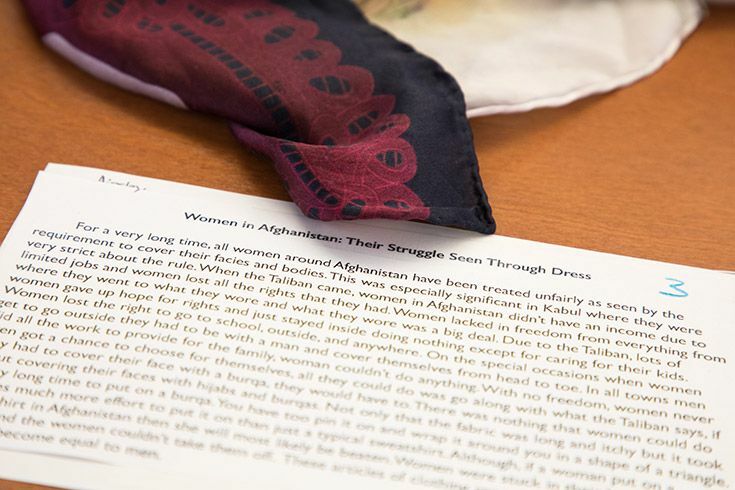 Example of an artifact (burka) along with the completed expository paragraph. As our students work on projects in geography and English, they dive into research about deforestation and other Afghan environmental issues in science class. Working in groups they plan and film short videos to present their findings. Science teacher Ms. Eva Farina-Henry gives the class full creative license in making the videos as long as they convey their research with accuracy and in a way that is captivating for the viewer to watch. Working with math teacher Ms. Andi Whiteford students create a diorama of the main character's room to scale. In the book, the writer describes her room as being “ten by twelve steps.” The author also describes the furniture and how it is placed in the room. 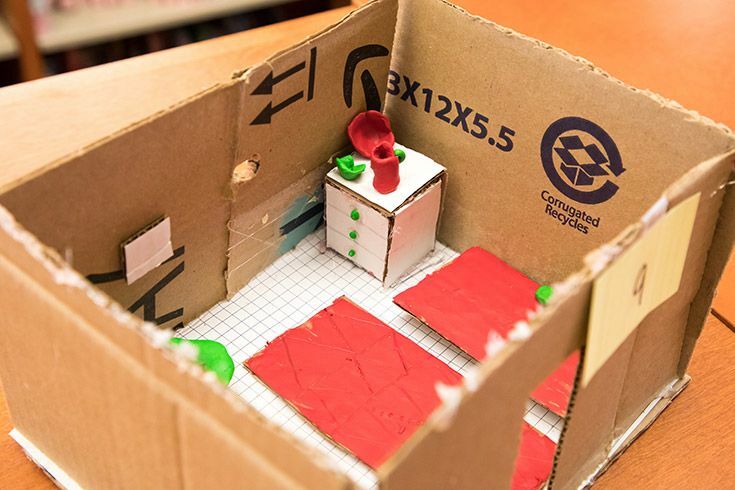 Based on these descriptions, students create a technical drawing of the room on graph paper and use that to construct a proportional model using cardboard and clay. Students make every wall and piece of furniture by hand and to scale. If students can articulate what they are thankful for in their own lives, they can better understand what it might be like to live without some of those things. 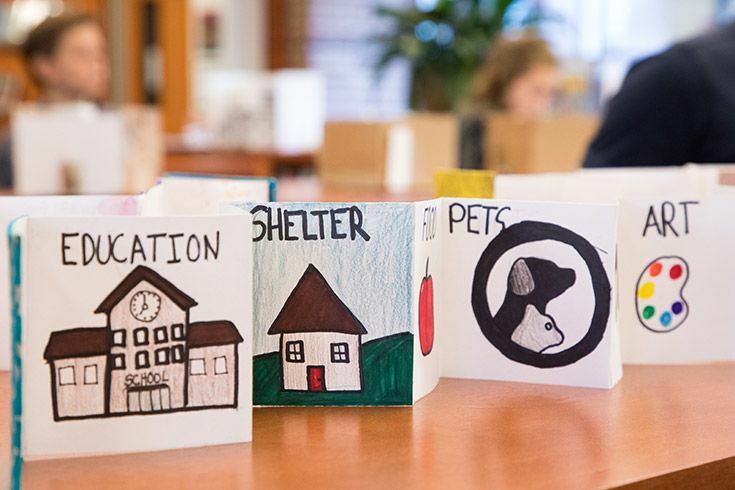 Art teacher Ms. Yehee Shin assigns gratitude accordion books to help her classes make connections to the characters while developing bookmaking and illustration skills. 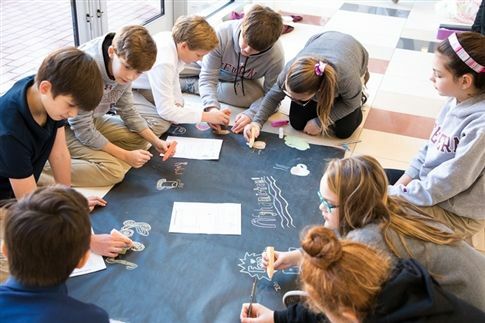 On the day of "The Breadwinner Museum," she also works with students to create a collaborative graffiti wall using images and terms from the book. A sample gratitude accordion book. For the final day of the unit, our sixth-grade teaching team works with Ms. Etchison and library associate Ms. Diana Michel to transform the Teel Campus library into "The Breadwinner Museum." Students act out Breadwinner-inspired narrative skits for a lively audience in the Bremer Room. They critique writing samples and dioramas on display, eagerly watch their peers’ videos and work together to create a piece of art to describe Afghanistan with a visual design. It is an immersive and interactive experience that engages our students from every angle. Each student filled out a reflection form to comment on their classmates’ work. Authentic learning is integral to our Middle School curriculum. Through projects like this, students understand larger themes that span disciplines and relate to the world outside Severn. They learn that culture and identity are a combination of many elements — from history, climate, and economics to personal perspectives and relationships. They learn to empathize, collaborate and how to dive deeply into a topic using academic research and thoughtful analysis. Students creating a graffiti wall about Afghanistan.